Wiener Städtische Versicherungsverein has transformed the 2018 artistic covering by stand-out Austrian artist Gottfried Helnwein into 444 unique bags – ten of them are up for grabs on Facebook. “We also want to minimise the environmental footprint of our arts and culture projects. 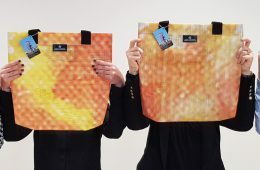 This is why we are again producing bags made from the Ringturm wrapping, and at the same time laying down a marker for sustainability, social responsibility and environmental awareness,” explained Günter Geyer, Chairman of the Managing Board of Wiener Städtische Versicherungsverein.